Yes as a blogger on Blogger, there is the button "Publish" in the top corner of the data entry page. 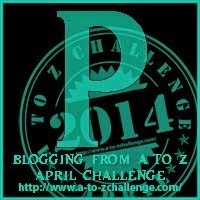 There are some other "P" words I could have chosen that would appropriately fit into the A to Z Challenge pages. Like "Procrastinate" or "Postpone". However, I know many of the "participants" don't do either. Regardless, not able to hire a full time tech-writer or editor for my page has created several of published posts to resemble the work of 6th grader on prozac. I am a horrible speller and I use this blog to improve my typing and writing skills. Not necessarily to improve my story telling abilities. I also enjoy the notion that total strangers read what I have to say, and occasionally let me know what they think. I do mean occasionally. However, I have been keeping up this blog for many years and I do not see slowing down anytime soon. So go out there, live on the edge and press the publish button. Enjoy your A to Z Challenge writing. Good luck with the A to Z . . . . . I too cant spell (or type) and rely on my faithful old PC to save me from writing gibberish.